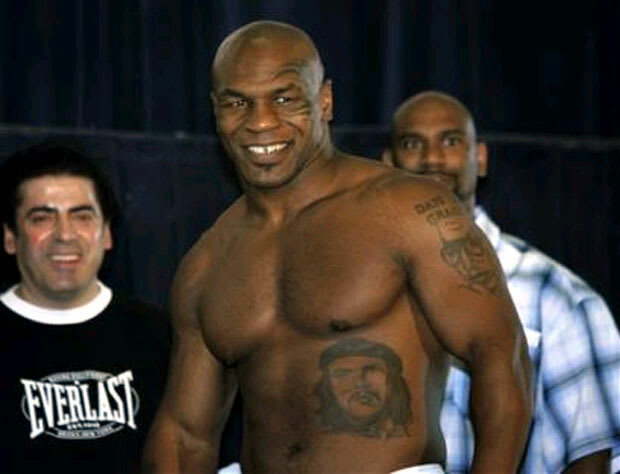 Yes, Tyson ranks among those fighters bitten by the tribal bug (including, but not limited to the following: Miguel Cotto, Kermit Cintron, Robert Burns, Winky Wright, and Angel Manfredy). Iron Mike's face, for reasons completely outside the sport, is the most famous. Due to visibility, the inking around Tyson's eye detract from his other work. Portraits of Arthur Ashe, Chairman Mao, and Che Guevara adorn his person — magnificent in broadcasting Tyson's own internal conflicts. Many fighters have portraits (like Cotto's recent one of his father), none match Tyson for the power of selected figures. Ranked high for iconic value.